ITALIA- that’s all you really need say and you think --> pizza, wine, happiness, repeat. Add--> art, history, GRAND sunsets and amazing aperitivos, and you get Firenze. Guille and I stopped in Florence, the capital of Italy’s Tuscany region, for a quick 48 hours in between our London and Paris adventure and our time there was incredibile. We met up with my one of favorite travel buddies in the whole world, Marcela, who is currently studying abroad in Florence and she took us to the best little spots in her free time, which I will share now with you guys! 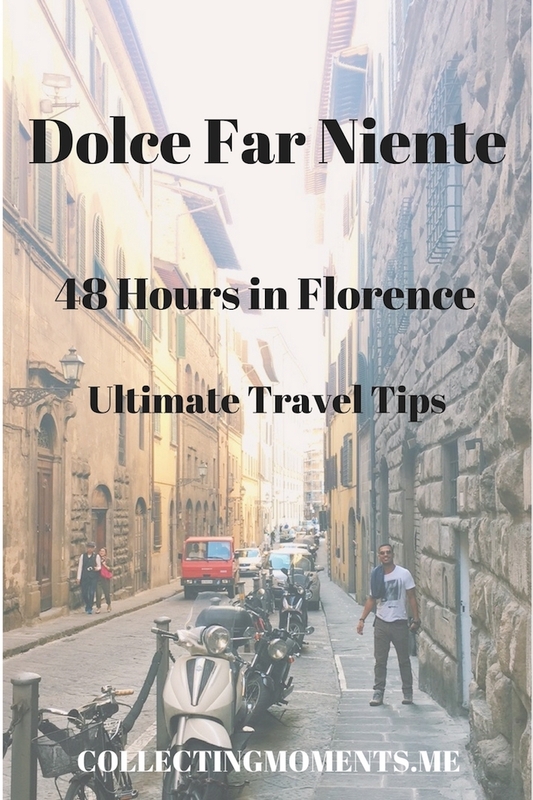 As I previously shared in my Paris post, traveling within Europe can be pretty inexpensive if you plan ahead, and we found great flights from London-Gatwick to Florence. However, the only downfall about traveling with low-cost airlines (we flew Vueling) is the odd times flights may be offered; we landed in Florence after midnight and flew out of Florence to Paris at 6:00am. From the airport – Because of time we arrived and left Florence, the only option we had was a taxi. The taxi ride was about 30 euros each way to Santa Croce. However, if you travel at more decent times, you might be able use public transportation, which should cost half or less than half of what we paid. We stayed at a very nice Airbnb in the area of Santa Croce. We loved this part of town and would stay around here again! It was good balance between tourists, locals and students (well, that’s basically how Florence is) but we liked it better than the popular area around the Duomo, for example, where prices can be jacked up because of tourists. Le Vespe Cafè, Santa Croce – We loved this little Canadian spot for breakfast! So so yummy! We really liked this place for a couple of reasons. One, my friend recommended it. Two, they offered hot, savory dishes instead of the Italian light breakfast of a cornetto and espresso (nothing wrong with this, but I need MORE FOOD to start my day in a better mood lol) and finally, they had amazing healthy and vegetarian/vegan options! We had the parkdale and the dundas! Both were deliziosi! Trattoria Quattro Leoni, Pitti – This trattoria is hidden in a little plaza near the Ponte Vecchio. It’s a pretty popular restaurant that accepts reservations and has a cool rustic décor. The service was excellent and so was the food. We shared a salad and a mushroom risotto. The Corner, Uffizi – We ate lunch here and liked their Mediterranean touch on food items. We sat on the outside terrace, enjoyed the beautiful weather and shared a shrimp salad and pasta pomodoro + wine. Cantina del Gelato, Pitti – Best gelato everrr!!!! I’ve had my share of gelatos and highly recommend this gelateria as one of the best I’ve tried! The gelatos were so creamy and just divine. I had the nutella and nocciola flavor and Guille the coconut one. SOOOOOOOO GOOOOD! Mercato Centrale, San Lorenzo – Foodies paradise! This market has so many of options when it comes to delicious Italian staples like pasta, fish, sandwiches and much more. We ate at La Pizzeria Sud and loved our Neapolitan style pizzas. Soul kitchen and Oibò, Santa Croce – My favorite pastime when in Italy is aperitivo time! Lol and I was beyond ecstatic to enjoy GREAT aperitivos in the Santa Croce area. Both places are right next to each other and offer a great buffet with delicious food options with the purchase of a yummy drink from around 7pm-10pm. We paid 10 euros/each for Oibò and 8 euros/each for Soul Kitchen. Moyo, Uffizi – After aperitivo (actually apericena since this was our dinner! lol) we had a great time at Moyo; a cool restaurant/lounge bar, playing some fun music with great drink specials. Piazza di Santa Croce – We started and ended our days here as we were staying two blocks away! Hehe The plaza is very big and the Santa Croce church is spectacular. Ponte Vecchio – Visit the famous bridge, but then make it to one of the adjacent ones and watch the sunset over the Ponte Vecchio! Piazza di Santa Maria Novella – Another beautiful plaza and charming little church. Galleria dell’Accademia – Go see the ONE and ONLY David by Michelangelo. Cattedrale di Santa Maria del Fiore – Go to the top of the Duomo and see the best view of Florence + the inside of the unique and stunning cathedral. Palazzo Pitti + Boboli Gardens – Don’t miss out on visiting the palace, the museums and exhibitions and later strolling through the grand and scenic gardens. This one is by far my favorite activity in Florence! Piazzale Michelangelo – We ran out of time and did not get to visit this square on top of the hill with a panoramic view of Florence, so it is a big must on our next time in town. Cooking class – Next time, I will set aside a day and pay for a Tuscan cooking class! For a full day, you go buy fresh ingredients in the market, then cook a four course Tuscan meal with the help of a chef in a farmhouse in the countryside while also savoring different wines!! Uffizi Gallery – We didn’t have time to go inside the art museum this time and would love to see their exhibitions another time. Grazie for reading and make sure to share! Let’s keep Collecting Moments!